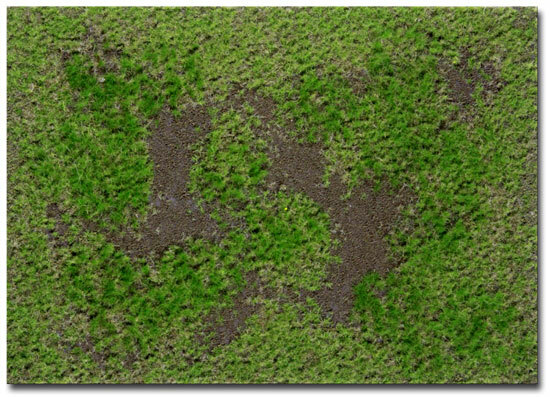 SPRING ROUGH MEADOW TYPE "A" MAT - Various layered heights of medium spring-green tufts randomly placed on a 'Rough Meadow' dark brown textured floor. Measures approximately 11-3/4" long x 8-1/4" wide. 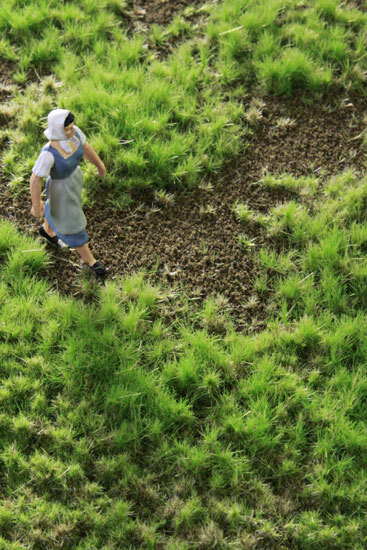 This mat consists of shorter 1-2mm tall and 4mm tall grasses. The mat is designed to replicate the beginning growth of spring fields having a 2mm muted green growth from the last season at the base and random sprouts of spring tone 'new grass' growing up from the center. Ideal for smaller scales and for most temperate seasons. The mat represents un-maintained growth with years of grass regeneration. Within each cluster of grass is a sparse base layer of 1-2mm dry grasses dead and dry from previous seasons. Sprouting from the same area are 4mm tufts of new healthier grasses in two tones in random fashion. 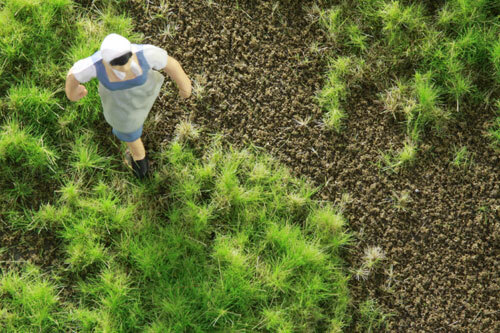 The grass clusters are randomly placed by hand and gently feathered into fine unhealthy soil. Measures approximately 11-3/4" long x 8-1/4" wide. The backing is a super-thin tan vinyl film that cuts easily and adheres perfectly to surfaces. By heating the mat with a common hairdryer, the vinyl backing will conform to terrain surfaces. For small patchwork type placement we recommend a latex based adhesive such as Täk-E-Glue or Hob-E- Tac. This glue will allow for fine intricate detail without having raised edges that sometimes occur if glue has not covered the entire surface. For larger areas a Web Spray adhesive may be the best solution. We recommend using scissors or hobby knife to cut this mat. Tearing will create 'puckered' edges which are difficult to glue down and burnish smooth. Shown with O-Scale Figure to indicate scale reference. Martin Welberg products are developed for every scale model size.